According to the exhibition catalog, “True Faith explores the ongoing cultural legacy of Joy Division and New Order, and charts how their ideas were in turn absorbed, translated, and transformed in the work of other artists, designers, photographers and film makers.”  On entering the gallery one of the first exhibits one comes to is a long case displaying a selection of Peter Saville-designed record sleeves. 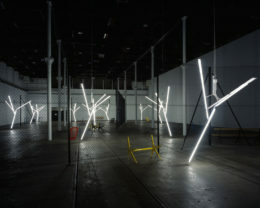 Admittedly, they are beautifully designed artifacts, but just what is achieved by displaying them in a gallery context? There was always a sort of cachet to owning these records because the design element seemed almost subversive in the way it married high art sensibilities with mass production. In this, Saville was more impressive than Andy Warhol because Warhol attempted to import an aesthetics of mass production into fine art whereas Saville was imprinting the commodity with a genuinely conceptual image. This made the owner of a Joy Division record feel (as many others have noted) like he was the owner of a genuine work of art. So it’s difficult to see what is achieved by presenting the sleeves in a gallery context. It seems to bestow the sanction of the art establishment and in so doing it undermines the subversive role that their original distribution had achieved. Another work that reflects in some way on Ian Curtis’ sublime angst is Glenn Brown’s Dark Angel (for Ian Curtis) after Chris Foss (2002). 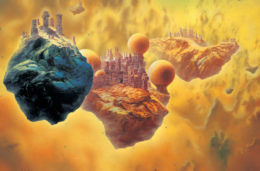 Like many of Brown’s works, Dark Angel is essentially a piece of artistic plagiarism, in this case copying the science-fiction art of Chris Foss. Whilst at one level this brings into play those hackneyed questions of authenticity and high art/low art distinctions, it also allows for an associative free play, in this case marrying Ian Curtis with sci-fi visionary art. The painting (which is very large) provokes a feeling of sublime apprehension as we are invited to contemplate a wholly alien landscape, moreover one which is simply imaginary. In other words it brings into play the sublime landscape but denies it an actual, terrestrial referent. It is a sublime response to a virtual world. In the same way, Mark Fisher described Joy Division as, “Schopenhauerian” because of “the lack of any apparent object-cause for their melancholia.”  Ian Curtis seemed to channel his creative (and destructive) energy from elsewhere. His lyrics generally avoided social critique because he was seeking not social reform but to immanentize the numinous. Brown posits a world which is wholly other, whence, perhaps, Curtis’ dark angel transmitted its occult messages. In the exhibition catalog, the curator, Dr Maria Balshaw, writes about the May 22 terrorist attack in Manchester: “None of us should ever have to face such terrible loss, but the city and its people have decided to deal with this in a Manchester way. We stand together, as a diverse, open, loving, irreverent city – and our solidarity is supported by people all over the world. The tweet that went global took its words from Joy Division’s most famous song. It said, ‘If you think Hate Will Tear Us Apart, you chose the wrong city.’”  The poetic genius of Curtis’ original lyrics for Love Will Tear Us Apart was in identifying the thing that draws people together as being the very thing that pulls them apart. It was a moment of miserable dialectical clarity. To reduce it to an impotent platitude is to destroy its import completely. 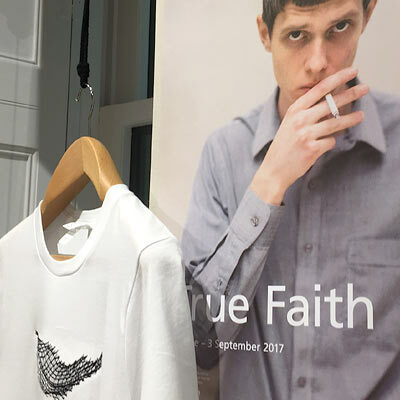 Visiting True Faith is an enjoyable experience. And perhaps that’s the problem because Joy Division and, to a lesser extent, New Order were always about something other than enjoyment. As I have argued elsewhere , Joy Division were seeking some sort of transcendent beauty but had no structural way of dealing with it. Ian in particular was always carrying the weight of this absent numen. In addition, any sort of artistic response to or contextualization of Joy Division is going to face the problem that it will be insufficient to its source material. Even really great art inspired by Joy Division will not be able to tune into the same dangerous frequencies that Ian Curtis’ psychic antennae were receiving. In order to experience the dark visions that Joy Division were conjuring with it is only necessary to place the needle on side one of Unknown Pleasures sometime around dusk, and listen. Some dead soul (who might be Ian) will take you by the hand and show you what was and what might be.